When you are ready to camp with the comforts of home in a bold fifth wheel, hitch this Minnie Plus to your half-ton truck and head out. Model 25RKS provides sleeping space for 4-5 so you can take the kids or grandkids with you. The kitchen includes solid surface countertops and appliances to make meals where ever your camp. You can even keep your electronics charged the whole time with the USB charging ports. The dual entry bath is a convenience you didn't even know you wanted until you have it. 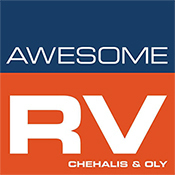 Come see what else makes this the perfect RV for you!